In the middle of Turkmenistan’s Karakum Desert lies one of Central Asia’s more unusual attractions – a huge crater in which gas escaping from hundreds of cracks in the ground burns day and night. 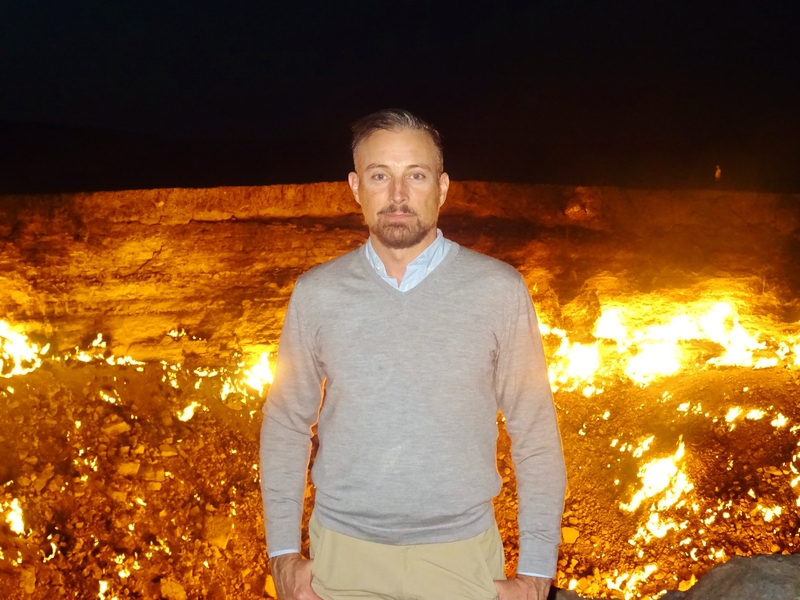 Yet these seemingly eternal flames are no relic left by the Zoroastrian fire worshippers who once lived in the region: the blazing pit is the result of an industrial accident. Dubbed the Gate to Hell, the crater was created in the early 1970s when Soviet gas prospectors were drilling. The unstable ground collapsed into an underground cavern, releasing poisonous methane gas and leaving a gaping hole seventy metres wide and fifty deep. Some say the Soviets set the gas on fire to prevent it spreading. Others claim local shepherds, tired of their livestock being gassed or falling into the crater, threw a burning tyre into the rocky abyss. However they started, the fires are still burning today, the flames that rise from the ground producing a low but constant roar. In parts, the ground around the rim of the crater feels less than solid and it is clear to see where it has collapsed into the depths below. If you stand on the edge, the crater smells like a giant gas stove. A sudden change in the direction of the wind can bring a blast of hot air, forcing you to stagger back from the intense heat. During the day, from a distance the crater can appear underwhelming. When daylight fades, though, it takes on a golden glow, gradually turning orange as night falls. Fire holds its own fascination but in the darkness of the desert night, the gas crater takes on a new allure with its myriad flames, intense colour and reassuring warmth. Rumour has it that the Turkmen government wants to put the fires out. Seeing this extraordinary feature while it still exists was one of the reasons why I wanted to visit Turkmenistan as soon as possible!